Hergé regularly visited the Cinquantenaire museum, part of the Royal Museums of Art and History in Brussels, when conducting research for his stories. In this museum he saw a model of a 'portrait vase' also known as a 'stirrup vase' because it has a stirrup-shaped handle through which one could pass a rope to attach it and other similar vases on to the llama. This vase dates back to the Mochica culture and was the inspiration for the vase drawn on page 45 of the adventure. When drawing the scenery for The Temple of the Sun, Hergé was inspired by several real places, including the Sacsayhuaman fortress, the Tiwanaku site and also the sanctuary of Machu Picchu. s ancient Inca city, today in ruins, lies high up on the Andes and was used as a model for one of the main scenes, the sacred site where the Incas set up the sacrificial altar. He also found an image of a mummy's head from the Chancay culture, which he incorporated into the design of the cover for Prisoners of the Sun and which also appears on page 45. In Wiener's book Hergé also discovered an illustration of the god, INTI, which he used for the book's title page and in the illustration of the grand hall where Tintin, Haddock and Zorrino found themselves when they manage to get inside The Temple of the Sun. This "God with Sticks" is the deity who adorns the Sun Door of Tiwanaku. The February 1938 issue of the National Geographic magazine provided Hergé with lots of useful information, particularly how to draw the Grand Priest when he presided over a sacrifice, the parade of young virgins of the Sacred Temple, and the snake dance preceding the sacrificial fire. This magazine was also useful for the scenery inspired by the Sacsayhuaman and Machu Picchu sites. Hergé owned a copy of the illustrated Encyclopedia of Railways, published by Librairie Hachette in 1927, which gave him plenty of information about the Peruvian railways locomotive and train. 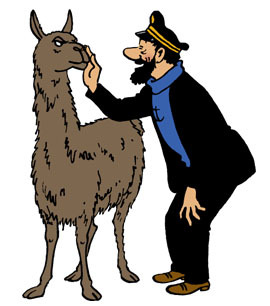 Jacobs assisted Hergé in many ways in his quest for accuracy and realism, including posing for Hergé. For example, Hergé made a striped poncho which he asked Jacobs to wear whilst he drew him. Jacobs also spent many hours in the Cinquantenaire museum researching South America and the Incas, in search of convincing detail for the adventure. Some of the results of this research were eventually used by E. P. Jacobs in the Blake and Mortimer adventure, The Atlantis Mystery. Professor Calculus is completely oblivious to what is going on around him throughout the entire adventure. At the most critical moment, when he and his friends await immolation on the sacrificial altar, he thinks that he is watching some historical cinematic drama. Hergé borrowed various elements from Gaston Leroux's book Wife of the Sun, for the crucial eclipse scene, in the same way that La Fontaine borrowed from Aesop. He was equally inspired by the text from the book Christopher Columbus by C. Giardini, published by Dragaud, Paris, in 1970, in which the author describes how the Spanish succeeded in forcing the natives to submit completely thanks to a lunar eclipse which had been announced in a calendar. It is also interesting to point out a mistake regarding the eclipse. In the book the eclipse moves from right to left, whereas in reality it should travel from left to right because Peru is in the southern hemisphere. This mistake was pointed out to Hergé by a child who wrote a long letter expressing his dissatisfaction. The Thom(p)sons introduce a new innovation to their methods of detection. Following the example of Professor Calculus, they resort to dowsing, but without much success. Thanks to this technique they become actors in a running gag, where their divinations echo the actual situation of our hero. In order to make the story fit the standard 62 page book format, Hergé had to do a huge amount of work reformatting and editing the frames which had appeared in Tintin magazine. Amongst the main scenes which didn't feature in the book, was one where Haddock dispenses with the enormous gold nuggets he had collected in his pockets, and another where he draws a chalk portrait of Tintin on a wall. The original version of Prisoners of the Sun was re-edited twice by Casterman Publishing, in 1988 and 2003, in the longer Italian format. The archetype of a complete Tintin adventure, involving plenty of trecking in an exotic land, several brushes with death, hostile natives and befriending a local boy - all to save an ageing and barely senile friend in Calculus. Many iconic moments abound, including jumping off the runaway train into a river (wouldn't we all want to try? ), discovering the waterfall entrance to the temple, as well as the solar eclipse. In just a few pages, the gang manages to encounter a condor and bear in the mountains, then a barrage of animals in thick jungle: an iguana, monkeys, an anaconda, a tapir, mosquitoes, ants, an anteater, crocodiles...must be a record when you factor in the llamas, the seagull 'appearance,' penguins and the lizard tickling Haddock's back. My 1st Tintin book completely takes with the Captain and Tintin to Peru on the adventure . I love this story and the 7 crystal balls very much.